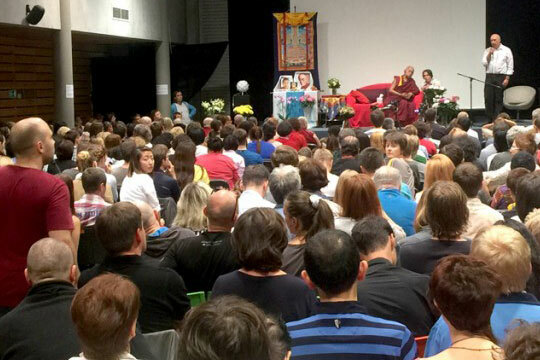 Lama Zopa Rinpoche teaching in Moscow, Russia, July 2015. It’s Almost FPMT’s 13th International Sangha Day! 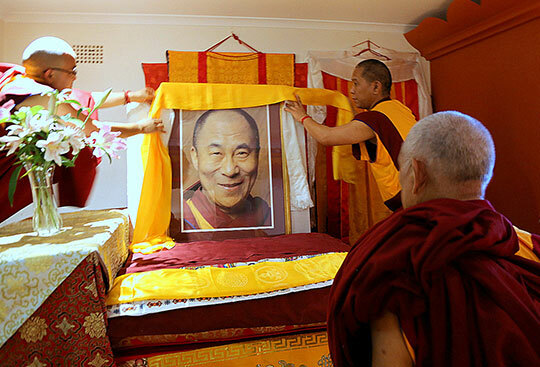 Rejoice: New FPMT Study Group in Australia! Many very inspiring celebrations of His Holiness the Dalai Lama’s 80th birthday have taken place around the world. On June 21 in Dharamsala, India, a huge long life puja was offered to His Holiness. Lama Zopa Rinpoche was invited to attend the long life puja and left his Australian teaching tour early in order to be present. On behalf of the entire FPMT organization, Lama Zopa Rinpoche made offerings to His Holiness the Dalai Lama during the long life puja. Read Rinpoche’s 1996 praise to His Holiness. 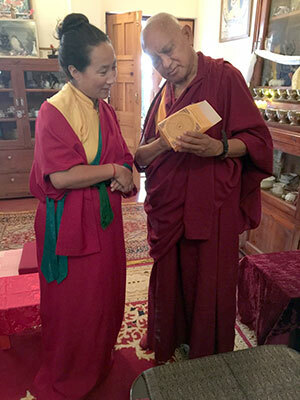 Recently, Lama Zopa Rinpoche reiterated how important it is that Dharma students help each other at the time of death. At the time of our death we need help the most, and we rely on fellow students to help us by doing practices as advised by Rinpoche. Learn how to support your Dharma sisters and brothers at this critical time by reading Rinpoche’s heart advice and practices for death and dying, conveniently collected together and ready for use. 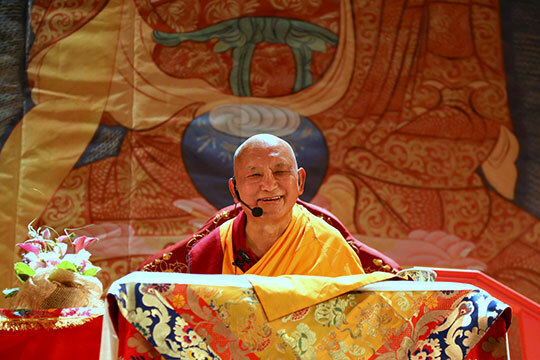 Lama Zopa Rinpoche teaching in Moscow, Russia, June 30, 2015. Lama Zopa Rinpoche with Khadro-la, Lama Yeshe’s room, Tushita Meditation Centre, Dharamsala, India, June 2015. Please rejoice that US$200,000 has been given for aid relief in Nepal from the Nepal Earthquake Support Fund for those affected by the 7.8 magnitude earthquake on April 25, 2015 and subsequent 7.3 magnitude aftershock which occurred in May. 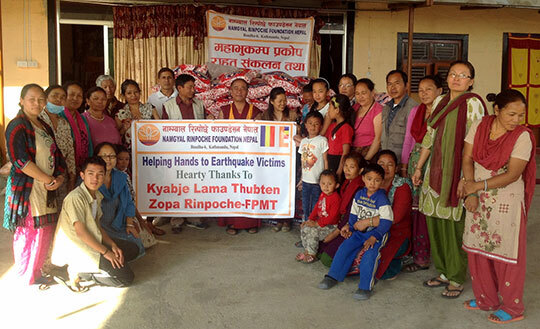 Recent contributions include: US$50,000 to help support the ongoing work of Losang Namgyal Rinpoche; US$50,000 to support the essential aid offered through Kopan Helping Hands; US$50,000 to help rebuild Lawudo following extreme damage to the library, old gompa and prayer wheel; and US$50,000 in grants to provide essential relief to several Nepal villages. Thank you to all the kind donors who are making this level of support possible. You are welcome to contribute any amount to the Nepal Earthquake Support Fund so that grants and offerings such as these can continue. The Preliminary Practice of Vajrasattva eBook, also available on Amazon.com along with other titles. Armor Protection Wheel and Black Manjushri PDF: This is a collection of two practices composed by Lama Zopa Rinpoche intended to remove obstacles and offer protection from harm. 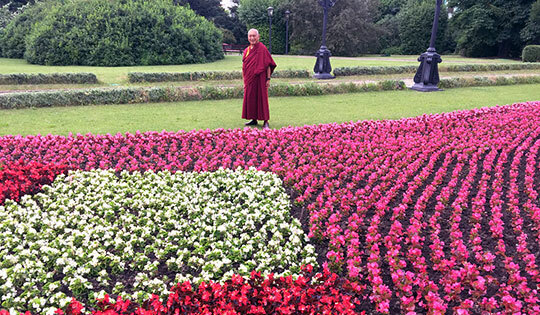 Lama Zopa Rinpoche touring gardens in Moscow, Russia, July 2015. The collected offerings from our generous Merit Box practitioners and supporters have been turned into a new set of grants for 2015. US$52,000 has been awarded to 14 different projects, including support for Sangha to attend retreats, a new Mindfulness & Compassion initiative, construction of holy objects at centers, and more. See the full list here! Mandala’s online feature for July answers the question: “How Do Holy Objects Work?” Ven. Tenzin Legtsok, an American monk in his 12th year of geshe studies at Sera Monastery in India, discusses the power of stupas and other sacred objects. Looking for more good stuff to read online? Don’t miss Mandala’s online content for our July-December 2015 issue. Copies of the new, redesigned Mandala can still be ordered from the FPMT Foundation Store. After a long delay due to the devastating earthquake in Nepal, we’re happy to announce that a shipment of holy objects and other items to support your Dharma practice has finally arrived. We realize that many of our most popular items have been out of stock for a long time and we thank you for your patience and continued support. Please take a look at our superior incense selection, authentic ritual items, beautiful brocades, and inspiring prayer flags, among other quality Buddhist accessories from Nepal. Rinpoche would like all centers, projects and services to use the “Requesting Prayer to Padmasambhava” when inviting Padmasambhava (Guru Rinpoche) statues into their new homes. FPMT International Sangha day celebrates FPMT Sangha on Chokhor Duchen, when Buddha first turned the wheel of Dharma, which this year falls on July 20, 2015. Please join us in showing respect for and appreciating the work and devotion of FPMT’s nuns and monks! “The next course of LRZTP is about to start this coming October. For this course we have only 20 places and more than half of them are already taken. Registration is still open until the beginning of August. So, if you are considering offering Dharma teachings in Tibetan at your center with a qualified geshe and interpreter in two years’ time, now it is the time to look for a suitable candidate from your community and send them to train in LRZTP 7. A reminder that we have made available portrait-style photos of our lamas in high resolution for use by centers, projects and services – including newly added photos of His Holiness the Dalai Lama as part of our celebrating his 80th birthday! In addition to Rinpoche’s heart advice at the time of death, we have put together a list of suggested resources which would be helpful for a center to have available in order to assist individuals as they plan for death practically and spiritually, and assist and comfort the dying. We welcome new FPMT study group, Potowa, in Wagga Wagga, Australia! L’équipe du Service de traduction francophone de la FPMT est heureuse de vous annoncer la publication d’un nouveau livret : Le Yoga du Maître en six sessions. FPMT International Office, USA needs a part-time administrative assistant; Tushita Retreat Center in Spain needs various volunteers. Closed FPMT study group: Manjushri Study Group, USA – we rejoice in their efforts to serve sentient beings.